Sixth Day of Turtles – Adopt a Nest! 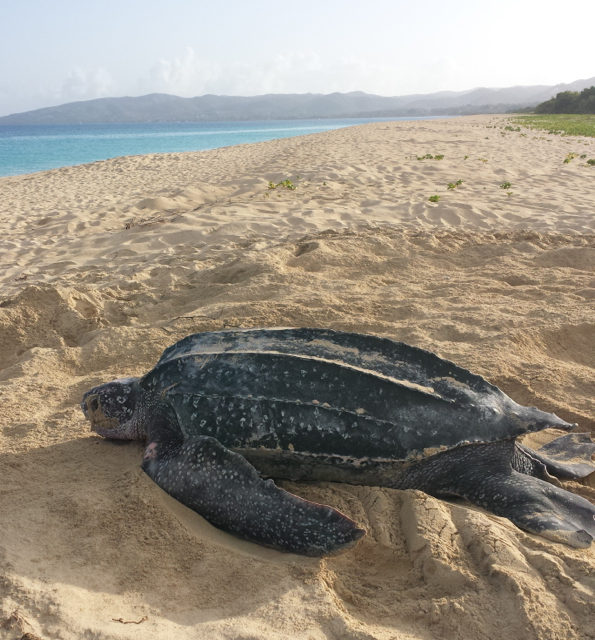 For our Sixth Day of Turtles, you can adopt your very own leatherback nest for a donation of $50 to the St. Croix Leatherback Project, through Sea Turtle Census at The Ocean Foundation. You will get a personalized certificate you can print (for anyone you choose), a project sticker and updates when your nest hatches. We will include information on the date and time your nest hatched, how many hatchlings emerged, and who the mother turtle was. To adopt a nest, visit this page, choose the $50 amount and then in Comments section, please let us know who the nest adoption is for – we’ll use that to make the certificate. Each May, our research volunteers head out in the late afternoon every single day to protect nests that are emerging. At Sandy Point, over the years we have observed that hatchlings like to make an appearance early – even before dark – many of you have seen this if you’ve been on a hatchling watch at the refuge. These hatchlings need protection from predators like frigate birds and night herons, who are only too happy to snap them up! Volunteer Nina watches a nest as it emerges naturally in the late afternoon. The St. Croix Leatherback Project is supported by the Sea Turtle Census Initiative, which is sponsored by The Ocean Foundation, which is a 501(c)(3) organization, based in Washington, D.C., but working globally to protect our oceans. A challenge for the Fifth Day of Turtles! Straw Challenge for the Seventh Day of Turtles – SKIP IT! The Sea Turtle Census Intiative is based at The Ocean Foundation, which is a 501(c)(3) organization that aims to support, strengthen, and promote those organizations dedicated to reversing the trend of destruction of ocean environments around the world. A turtle returns to the sea after nesting.